Gameloft is currently one of the biggest game developing companies in the World and that’s not a surprise when we consider just how versatile they are. For the last few years, they’ve been dominating in almost every single genre when it comes to the Android gaming. So they decided to try out and see if they will succeed with the strategic games too. Just by playing March of Empires for a couple of days, we can tell that fans of strategic games are going to like it. Especially the ones who prefer reading number charts rather than of playing the game. But sadly, the ones who prefer actual gameplay are going to be kind of disappointed. I mean, March of Empires is generally a very good strategy game, but it’s not perfect. There are lots of things that are good such as depth, graphics etc. But, also, there are things that are dragging the game down, such as gameplay. Lack of gameplay is probably the thing that will bother players the most, together with bad battle scenes. The whole concept of March of Empires is basically the same like every other strategic game. To be honest, you’ve probably already played a lot of games that are just like this one. But, if you aren’t a big fan of this genre and haven’t played any strategy games before, we will break down the most basic things you should know before you start playing. As soon as you start the game, you will be asked to select and possibly customize the character you want to play. Later on, you start to build your empire and battle for the territories. Also, during the game, the stronger you get the more points you will be getting. So you’ll have to spend all those points on all sorts of different upgrades. This is the basic concept of every strategy game, but March of Empires has some additional stuff, so we will explain everything about this game’s gameplay. When you start to play the game, you’ll recognize the very familiar pattern of character picking. In this case, you will be asked to select one of the three different character types.For example, a King is will give you an opportunity to play with fast units who can build stuff in a really short period of time. The other two characters are a Sultan and a Tsar. Every single of these characters is different and has a different function in the game, so the difference isn’t just in the looks. That’s why it would be smart for you to read what each character does, so you could choose the one that suits your playstyle the best. To be honest, the only thing you will be doing for the first 15 minutes is the building upgrade. So, all of you who find taping on the buildings boring, be patient. Even the tutorial is mostly about upgrading, so don’t be surprised if you spend most of your time just by jumping from building to building. But there is one cool thing that most of the players will love and that is troop positioning. This is a perfect example of how a strategic game should give some extra options for all of us who like to prepare some special tactics for the battle. Even after the battle, you will get a reminder of how you set up your troops and what kind of job your opponent did with his. 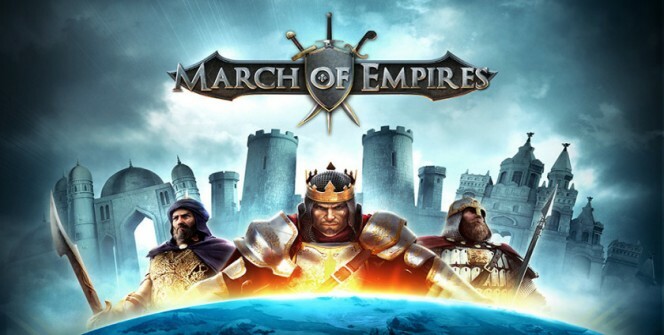 In order to play March of Empires, you will need a device with iOS, Android or Windows. Sometimes when playing March of Empires, bluestacks ask you fee to pay but gives you option to download some apps. Every time it asks you just select “Install apps” and continue using it free. I hope you enjoyed this guide, please rate and share. If you have problems running March of Empires on desktop or any other issues, leave a comment below.